A NASA spacecraft circling Mars has found evidence of flowing water on the Red Planet’s surface — and in our time, not in some dim and more verdant past. New data reveal that Earth’s close neighbor boasts multiple seeps of salt-laden water that were wet, or at least damp, as recently as last year. The water may be many times saltier than Earth’s ocean, but there could be enough of it to provide a bonanza for humans exploring the surface. Eons ago, Mars had enough water to fill enormous lakes and rivers. 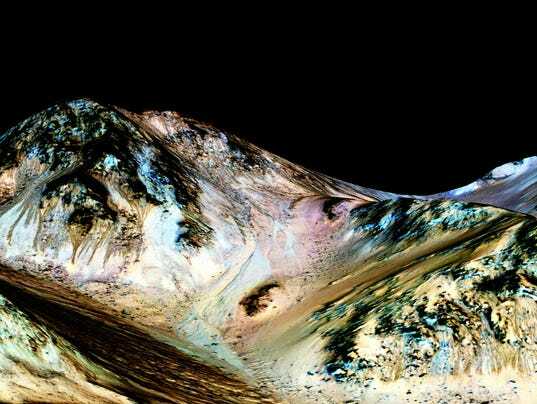 Scientists prospecting for the wet stuff in recent decades, however, had to content themselves with ice at the planet’s poles, small amounts of water vapor in the atmosphere and water locked up in minerals in the Martian soil. The wet Mars of billions of years ago seemed to have become a desiccated world. But five years ago, researchers spotted mysterious dark streaks running down the warm slopes of Martian craters and mountains. The lines disappeared in the cold season and reappeared in the warm season, like spring freshets on Earth. They looked tantalizingly like a sign of liquid water, but landslides or dust couldn’t be ruled out, said study co-author Scott Murchie of the Applied Physics Laboratory.